“Julian the Apostate: Scene, with Maximus the Philosopher.” Gregory Nazianzen, Homilies (879-883). Paris: BnF, gr.510, fol. 374v. Photograph Wikimedia Commons. The month of June marks the passing of two historically consequential rulers: the fourth-century Roman emperor Julian, posthumously referred to as Julian the Apostate, and the twelfth-century Holy Roman Emperor Frederick I, also known as Frederick Barbarossa. Their untimely deaths shocked the Late Antique and Medieval worlds, respectively. On June 26, 363, Julian was mortally wounded in the battle of Samarra during a Roman military campaign against the Persians. According to various sources, a spear delivered by a member of the Sassanian cavalry pierced his liver, and he subsequently died from the mortal blow some three days later. June 10, 1190, marks the day on which Frederick Barbarossa drowned in the Saleph River (the Göksu in modern Turkey) in the middle of the Third Crusade, the Latin West’s attempt to recapture the Holy Land from Saladin. 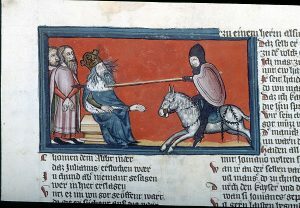 The deaths of both leaders in the middle of critical military campaigns generated either anxiety or derision among their contemporaries, as underscored in subsequent medieval representations of the two emperors. 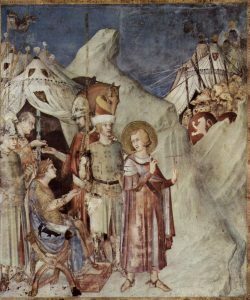 “Martin of Tours: Scene, before Emperor Julian” by Simone Martini. Chapel of San Martino, San Francesco, Lower Church, Assisi (1322-1326). Photograph The Yorck Project: Simone Martini [Public domain], via Wikimedia Commons. Posthumous medieval representations of Julian, the last Roman emperor who championed paganism, are almost always critical. For example, a lavishly illuminated ninth-century Byzantine manuscript of Gregory Nazianzen’s homilies (Paris, BnF, gr.510, fol. 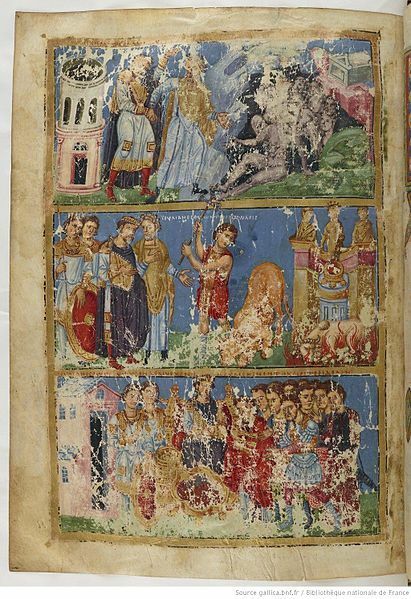 374v), depicts the ruler accompanying the pagan philosopher Maximus of Ephesus and venerating idols. In Simone Martini’s fourteenth-century fresco cycle in the Chapel of Saint Martino within the Lower Church of San Francesco in Assisi, the figure of Julian the Apostate serves as an arrogant, pagan, visual foil to the saintly Martin of Tours, who is shown renouncing military life for his Christian beliefs. Depictions of Julian’s death are even more damning. By the early sixth century, accounts surrounding Julian’s death shifted away from a battle against the Persians and amplified the legend of Saint Mercurius (identified as Mercurius of Caesarea in the Index database), a Byzantine soldier saint who rises from the dead and kills the pagan emperor with his lance or sword. 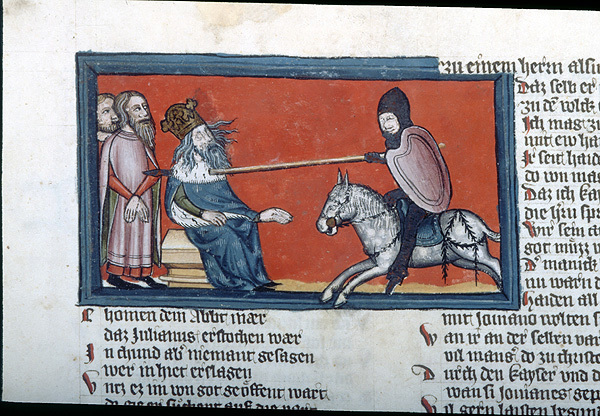 “Julian the Apostate: Scene, pierced by Mercurius of Caesarea.” Christherre-Chronik (c. 1360). New York, Morgan Library, M.769, fol. 327r. Although this legend developed in Eastern sources, it grew in popularity in the Medieval Latin West, even making an appearance in Jacopo de Voragine’s thirteenth-century Golden Legend. In a fourteenth-century Christherre-Chronik miniature in the Morgan Library (New York, PML, M.769, fol. 327v), the figure of Julian is portrayed as an elderly medieval monarch lanced by a fully armored Saint Mercurius astride a galloping horse. Cappenberg Head. Cappenberg, Klosterkirche (c. 1160). Photograph by Montecappio (own work) [CC BY-SA 3.0], via Wikimedia Commons. In contrast to the overwhelmingly uncomplimentary medieval portraits of Julian the Apostate, representations of Frederick Barbarossa generally evoke the idea of imperial majesty and power. 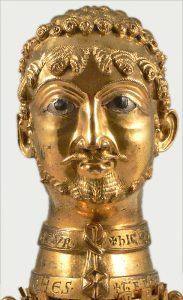 The so-called Cappenberg head (c. 1160), a reliquary that originated as a portrait of Frederick, effectively conveys an image of grandeur and stability through its precious materials and antique visual language. 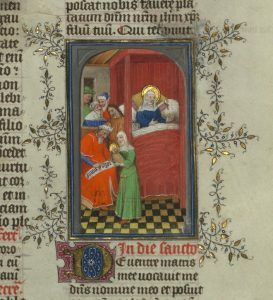 Yet a miniature drawn, less than a decade after his death, in Peter of Eboli’s De Rebus Sicilis (Bern, Stadtbibliothek, 120 II, fol. 107r) betrays the unease surrounding the emperor’s accidental passing. Inscribed FREDERICUS IMPERATOR IN FLUMINE DEFUNCTUS, the drawing depicts the ruler falling off his horse and drowning in the water, his crown lying ignobly in the riverbed. 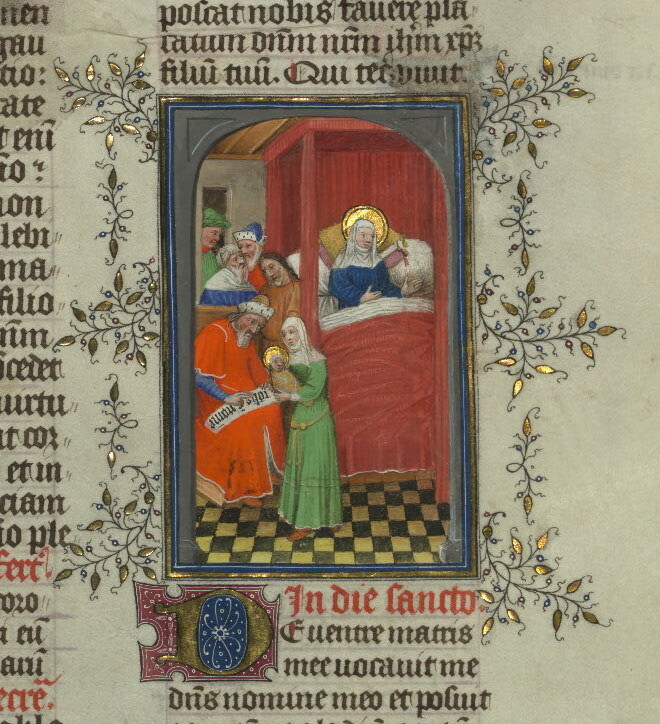 As if to combat the contemporary whispers that Frederick died without confessing his sins, the illuminator purposely included an image of the ruler’s soul as a swaddled infant held aloft by an angel and given to the Hand of God emerging from heaven. In so doing, the artist was participating in a larger, concerted effort to salvage Frederick Barbarossa’s reputation for posterity as a noble and most Christian emperor. 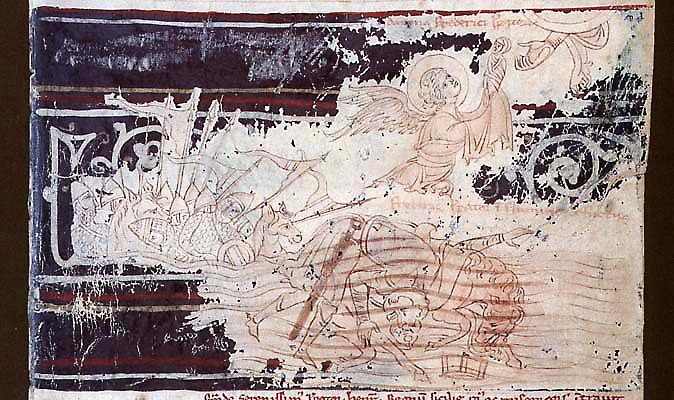 “Frederick Barbarossa: Scene, Death.” Peter of Eboli, De Rebus Sicilis (1195-1197). Bern, Stadtbibliothek, 120 II, fol. 107r (detail). Photograph Index of Medieval Art. Over the next few weeks, friends and users of the Index will see signs of our gradual shift to a new name, The Index of Medieval Art. This revision was undertaken after careful thought and consultation with Princeton faculty, students, administration, and the wider scholarly community. 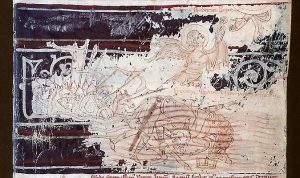 The change reflects the broad evolution of our institution’s scope and mission since its founding in 1917, when its work was limited to cataloguing religious themes and subjects in early Christian art up to 700 C.E. A century later, our records have expanded to encompass both religious and secular imagery, including Jewish and Islamic works, from the first centuries of the Common Era until the sixteenth century. The scholarly activities that we support and generate have also evolved over the years, reflecting the broad interpretive and interdisciplinary analysis that has become fundamental to the study of medieval images. Our new name signals more accurately our expanded holdings, mission, and goals, as well as our institution’s broad potential to serve researchers in multiple fields of study. If you have already bookmarked our Facebook and Twitter accounts using their original URLs, you’ll be redirected to the correct ones and shouldn’t notice an interruption. The new URLs for the sites appear below. In the coming months, we will also implement new URLs for this website and our redesigned database, which is set to launch in September 2017. We look forward to sharing news of those changes with you soon!